This does not have to be just about the world cup. There is so much more to explore here. Please do more episodes. Really love this and my 6th grade son does as well. It's a great bonding experience for us. Not a huge soccer fan, but am glad this podcast was recommended by my sister-in-law. Itâs World Cup and geopolitics and culture and biography and so much more all rolled into one. Great work! Excellent. For both soccer and non-soccer fans. Really exhibits the beauty of soccer. Any chance this will ever become a full time show, not just a seasonal one? If youâre a World Cup fan, this podcast is a must! Great podcast. Itâs not about soccer but rather the stories of people behind the game. Itâs fantastic whether you are a soccer fan or just a sports fan. 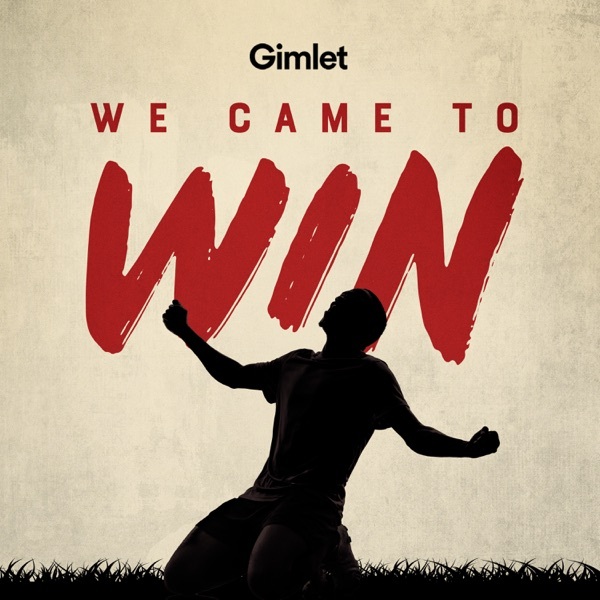 We Came To Win is now my favorite football show and the team nails how to capture the human drama of the beautiful game. Every story easily fits into the canon of global sporting Great Moments and gives us the best fresh (American, which is rare!) take on the moment. Love it, canât wait for a new season to kick off. I absolutely love this podcast! I really enjoyed the episode on Maradona! I only wish there were many more episodes. This podcast is like a favorite book, difficult to put down, easy to return to over the and over again, and with each revisit, something new is revealed. I binged this in one day and have already recommended this to all my football loving friends and to those friends who I wish would love football. For soccer fans and non fans alike, these stories are fantastic. If you are a soccer fan, you may know some of the stories. They are told well, and even if you know the outcome, you are still riveted. I also really enjoy the varietyâ not just menâs soccer, but womenâs soccer and refs are also covered. Soccer mom gives two thumbs up! This soccer mom barely knows the difference between a goal kick and a corner kick, and I love this podcast! Itâs great storytelling! Itâs well produced! Each podcast contains all of the character development, the villains, the victors, and the engrossing story that you want in any great tale. Seriously, listen to this. Mom says so. Great to listen to during World Cup. I didn't know most of these stories as a very casual fan, so these well produced ones were awesome. During his commentary on some of the soccer games I felt I was there. A Goalazo of a podcast!! Stories behind the sport, the players, and the fans of the most popular worldwide sport.... Soccer, FÃºtbol. A Goalazo of a podcast!! I donât like soccer. I have tried in the past to get into the hype of the World Cup but I couldnât ever muster any real enthusiasm. These guys have helped me understand a bigger story about what it takes to win and how teams and players get to the World Cup. Iâm definitely much more curious about the most popular sport in the world. Absolutely ignites my love of international soccer! Would be absolutely thrilled if it were continued!!! This podcast drew me in! The stories and politics are so interesting. I really enjoy stories about people, and that's what this podcast is about. The Zaire episode is so good. These stories need to be told! I enjoy the World Cup but admit I don't know much about the game or the history. We Came to Win was an amazing collection soccer moments and the stories of the players who lived them. I especially enjoyed the stories of Zaire's and the Spanish women's national soccer team. I would love it if they continued, epecially for the Women's World Cup. Great for soccer newbies and pros alike! What a fantastic show! Iâm only a casual soccer watcher (Olympics & World Cup) and I absolutely loved this show. It was so fascinating to hear all of these stories from soccer history, most of which I had never heard of before. I was very impressed by how many of the principal players they were able to get interviews with. I loved that they included a few episodes about womenâs soccer (really wish there had been more) and was in particular really surprised by Hope Soloâs early-career story. All in all, this is a fantastic pod and I really hope they come back to make more episodes. I would love to hear stories like this year round and not just before the World Cup. Great job! Excellent stories to help build my soccer history knowledge. Very entertaining and got me even more excited for the World Cup. Hope they bring it back for the womenâs World Cup next year! This podcast is the bomb! I love the stories, the personalities, the story telling ... all layered in history of one of the greatest sports of our time. My kids also love it. Gives them a greater sense of the game and how much passion surrounds the sport. You will enjoy this even if you are not a soccer fan. This podcast is excellent! Love the stories, love the enthusiasm. Too bad you made an episode about Hope Solo. She doesn't deserve to be apart of this, she's selfish and ruined women's soccer in the US. Soccer is dumb and boring. Bravo Gimlet! One of the most intriguing and entertaining podcasts I have ever listened to! Well done! I love this show so much and it definitely succeeded in getting me pumped up for the World Cup. Hoping for more episodes, perhaps leading up to the 2019 Womenâs World Cup. Loved the inclusion of Hope Solo and Vero Boquete. This podcast is such a fun, well researched and tightly edited gem. Plz give us more!! Gimlet you wonderful people you! The kind of stories that transport you, inform you, and leave you wanting MORE! As a newer World Cup fan I loved the interesting stories and background. Was especially great to hear stories about both World Cups - Men and Women. This is by far my favorite Gimlet podcast. The stories they've chosen to tell are so interesting and cover many other subjects than just soccer. Good mix of history, humor, reporting and overall storytelling. As a lover of soccer this has been pretty sweet way to learn about old World Cups and how they have changed the game before I even become a soccer lover. If your someone who has struggled to understand soccer this is a great show to get started. The stories will spark the interest in the game. Wish this was more than a mini series! This show is so great, I loved the historical approach. I would definitely keep listening after the World Cup. I hope they make more episodes! Very well done podcast and very entertaining. Thanks for creating this! Best Soccer Podcast ever !!! This is definitely the best soccer podcast that was ever made!!! The stories that are reported here are so interesting and amazing !!!! I hope you continue this great work for a long time !!! Fantastic job on this podcast, but Vila should take it easy on the over-dramatic pronunciations. He sounds very pretentious when he chews the scenery in those instances. Love that they give an inside look to some major events in soccer history. Key moments from the global game. Donât miss it! I recently started following soccer and when I heard about this new podcast through Startup, I had to give it a listen and I was not disappointed. The way the narrative lays the backdrop of the each story and sets up the listener to be lured into a roller coaster of emotions that are to follow as the stories are being retold by those who lived them is a work of art as the beautiful game itself. I donât know or watch soccer but seriously love this podcast. May be my favorite in the Gimlet Media stable. I dearly hope Iâll be listening for years to come. All of these have been really good. I've only followed soccer/football closely for about a decade, and these are some great stories re-told. Glad to see them being told by a diverse group. Great archival sound usage and re-creation. This review relives glorious moments of futbol. Love it!!!! Where is Season 2, we want more! Keep this delicious podcast going please!